If you’ve never had bacon in chocolate you are missing out on something mind bending! The salty sweetness of this maple candied bacon covered in chocolate is something Iv’e never had before until now and holy vampire’s it’s amazing! With my Strict diet and it being October the month of Halloween, where you see candy every where and it’s celebrated and eaten everyday, I feel like I’ve been missing out a bit. So instead of moping about wishing I could have all that candy I see at the store, I decided to make my own amazing candy. 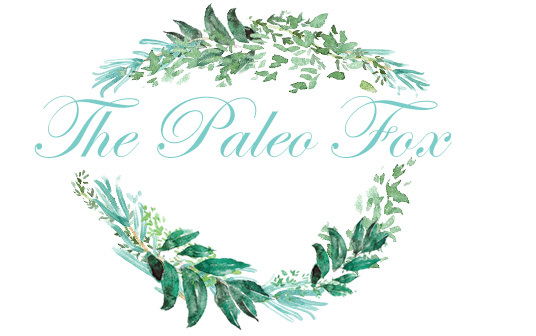 Perfect for my paleo diet! 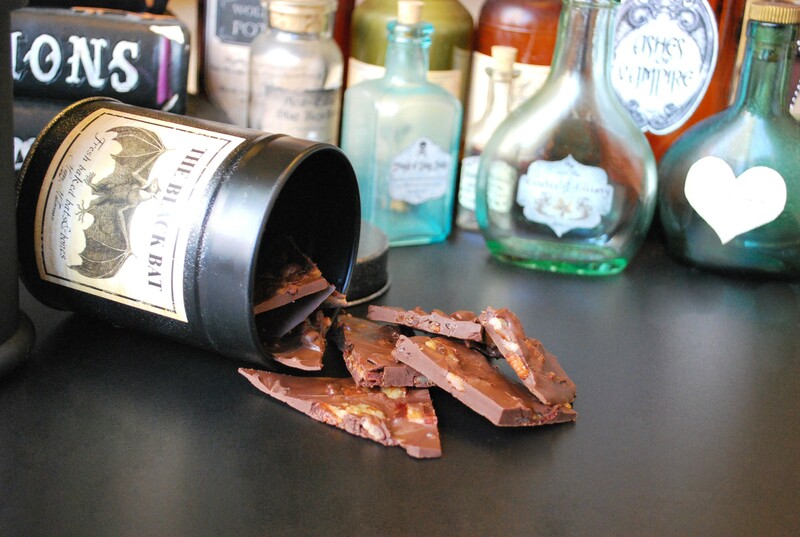 This chocolate bark is dairy free, gluten free, soy free, rice free, corn free, and nut free. It doesn’t have any of the things I can’t have in it and it has all the things that i love in it, bacon, chocolate and maple syrup! Sweet and salt perfection! for Halloween! Preheat oven to 300°F. Line a cookie sheet with a piece of parchment paper. 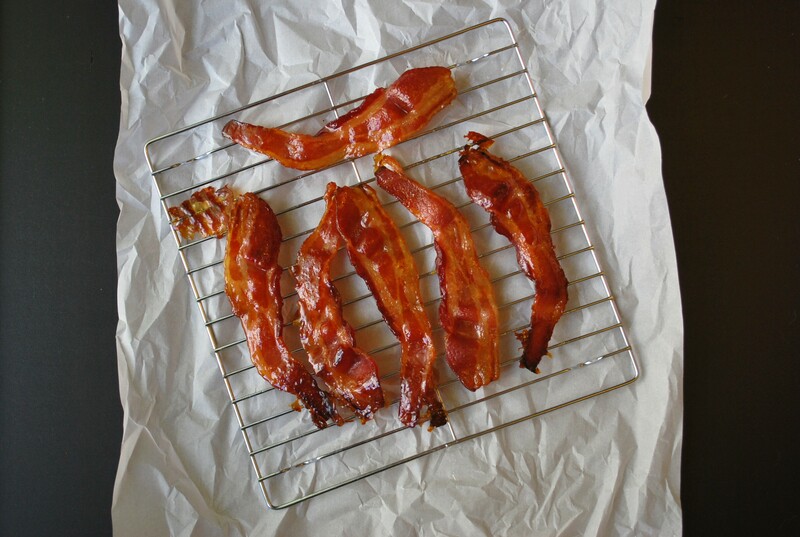 Lay the Bacon on the parchment lined cookie sheet and brush with maple syrup. Turn over the bacon and brush the other side. Cook the bacon for about 30 minutes. Checking often to make sure it is cooking evenly and not burning. 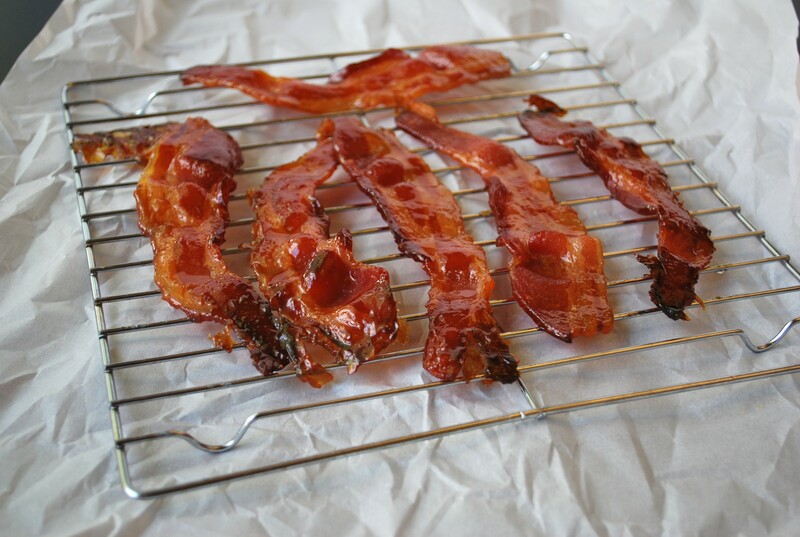 When the bacon is golden and looks completely cooked, remove it from oven and place the bacon on a cooling rack (as it cools, it will get stuck to the pan) to cool completely. Chop the bacon into pieces once it’s cooled and place in a bowl to the side. Fill a small saucepan with about two inches of water. Place a small glass bowl over the pan making sure the bowl doesn’t touch the water. Set it on medium heat until it boils. Put the chocolate in the bowl and allow it to melt completely stirring it the whole time. Place a clean piece of parchment on the cookies sheet and pour the chocolate out onto the parchment paper lined cookie sheet. Smooth/Flatten out the chocolate with a spatula until thin enough to be able to break up later. 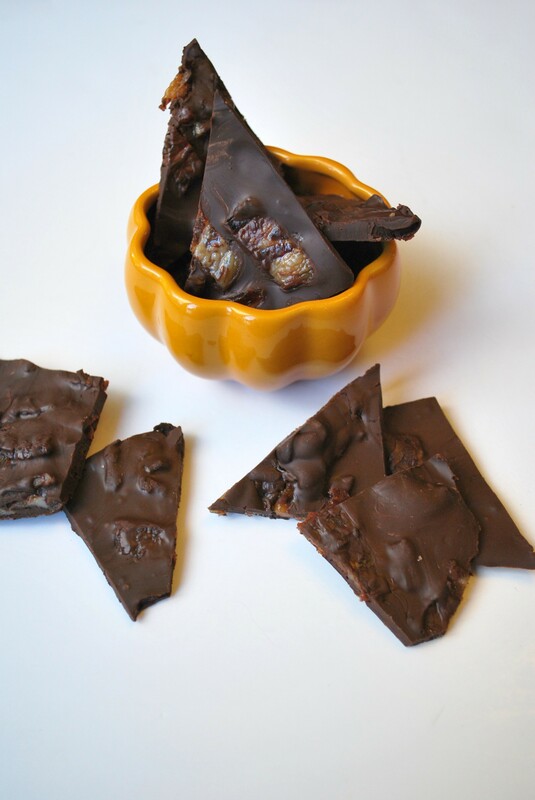 scatter the bacon pieces on the chocolate evenly. 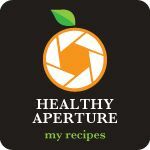 Sprinkle with the sea salt all over and smooth with spatula to cover the bacon with the chocolate, then place in refrigerator or freezer until only just hardened (about 20-30 minutes). 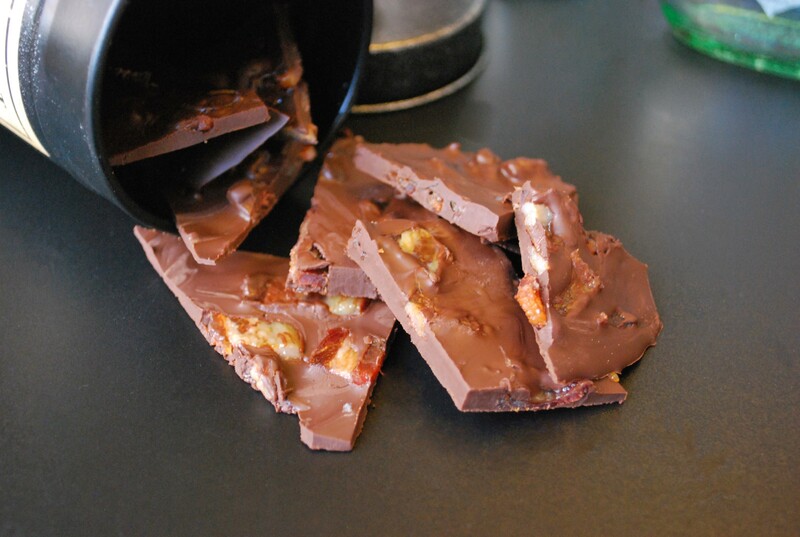 Break/cut with a knife bark into chunks and store in an airtight container in the fridge.